Editor’s note: This is part of a six-part series of stories on our interview with Gov. Brad Little. Additional stories will appear all this week. Governor Brad Little is blunt when he talks about the state’s transportation needs. And, even as a member of the Republican party, he’s not afraid to talk about the need for more revenue. Little said he felt he took a political risk during the GOP primary last year by saying the state needed to find additional funds for roads and infrastructure. Now that he is in the governor’s chair, the process to come up with the money is front and center. Gov. 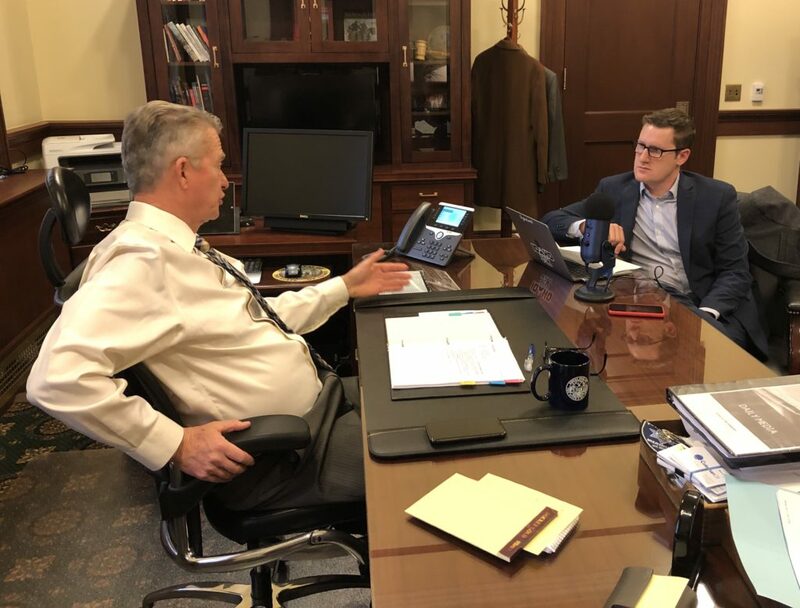 Brad Little with BoiseDev publisher Don Day in his Statehouse office Monday. Photo courtesy Marissa Morrison. During our extended interview, Little talked more than just big picture – but specifics about how infrastructure needs to change in the future. He said the state needs to look at how it handles right of way on road projects – especially larger projects like Eagle Rd. He said adding access roads or frontage roads can help cut down on roads that become a tangle of access points which impede traffic. He also said he isn’t opposed to high occupancy vehicle lanes on the state’s freeways. “I wouldn’t be opposed to a HOT lane on the freeway – a high occupancy transit lane for multiple occupant vehicles,” he said. Right now, Idaho law doesn’t allow for HOV lanes except in counties with populations of less than 25,000 residents that also have resort cities in their boundaries. Little said he would be OK with adding HOV or HOT lanes, but only if they are additive. Little maintains his home in Emmett in Gem County – but also has an apartment in Downtown Boise. His comutte when he’s staying in town is by foot. “If I’m in Emmett I’m I’m in the same mob as everybody else,” he said referring to traffic on State St. into Downtown. “I do know I can get from Emmett to Boise at 5 o’clock on a Sunday morning without much problem,” he said with a smile. While State St. gets a lot of focus for folks in cars in Ada County, he says traffic is increasing in many communities across the state. An option for a Local Option? Several mayors across the state, including Tammy de Weerd and Dave Bieter have said they would like to see a change in state law to allow for citizens to vote to enact a sales tax increase. The idea is the funds could go to help fund transit options – including rail, bus and other concepts. Boise Mayor Dave Bieter hit the issue again Tuesday morning will talking to members of the Building Owners and Managers Association. 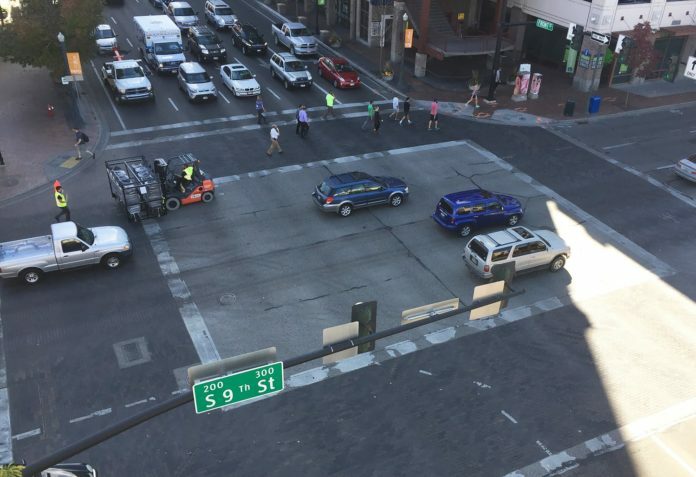 But Little points out that most areas have other methods they could use to boost transportation – particularly Ada County. 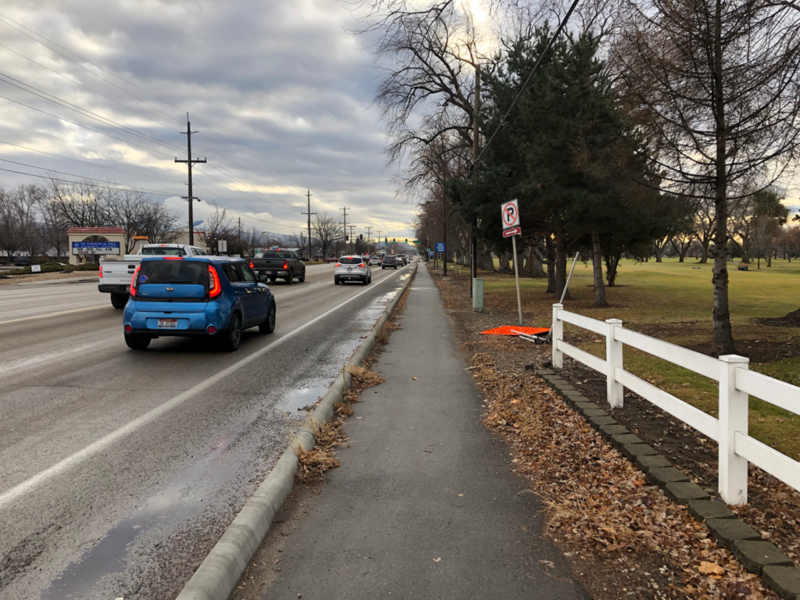 During a forum with Boise State Radio and the Idaho Statesman last fall, Meridian Mayor Tammy de Weerd acknowledged there was another path. “That’s something we always hear from the legislature – your property taxes are so high,” she said. “If we want to improve anything, we have to put it on the property tax. Local option tax would give it another level of (ability). Little says while he isn’t fully opposed to a local option, he says the devil is in the details. He said that defining a boundary for a local option tax can be tricky. “Overnight retail space on the edge of that line will get to be worth more,” because folks might cross the line to save on the extra tax. But Little noted there are other models that could be studied. He cites the way Arizona funds transit. In Idaho, according to Little, the state has nearly twice as many road miles per person as surrounding states like Oregon, Washington and Utah. But he says the legislature knows he’s “all on” on some sort of funding change for transportation.